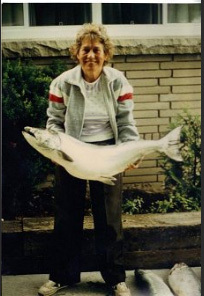 Mom was a great fisherman. She also was a the first woman licensed to pilot Toronto Harbour. This was not her record. This was certainly one of the average days for Lundy’s Charters. I was so sorry to hear if Sandra’s death. Thank you, Lynne, for tracking me down. Sandra and I were best friends for about 7 years in Scarborough. When we moved to Oakville in 1953,she continued to come to our family cottage for the summer for a few years. Then life took over and we went our separate ways. Sandra got married,and I went on to work and live in many places after graduation as a Physiotherapist. It was wonderful to read your blog Lynne. I remember every square foot of the house in Scarborough,especially sitting around the kitchen table eating piles of smelt fish that Mr. Wilson had just netted-Yummmm! So thanks Lynne.You took me back to some of the best years of my life. God bless Sandra and he family.